This family in Bletchley were looking for an attractive way to increase their space. They settled on a uPVC Gable style conservatory. These are recognisable by their tall, sloping roofs with a gable front. They offer an ample amount of floor space so are perfect used as a dining room or living area. In this case, the family have chosen it to become an extension of their living room and it gives a comfortable room that can be enjoyed by the family all year round. Classic white was chosen for this conservatory as this matches the home’s current windows. However, our conservatories are available in 150 RAL colours as well as woodgrain finishes. This allows you to choose the colour to match your home or be creative and stand out from the crowd. All of our uPVC conservatories offer efficient insulation and weatherproofing. 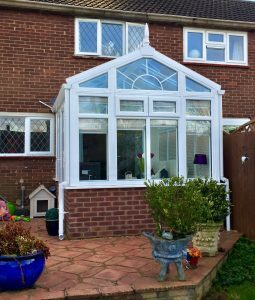 With a multi-chambered profile, gone are the days of abandoning your conservatory. In the winter, your heat is kept inside your home and during the summer, the room will never overheat. The glass used for this conservatory is Pilkington ‘activ’ blue. This innovative glass is self-cleaning as well as having solar control. It’s able to deflect heat while still letting in ample amounts of sunlight to give a bright and welcoming room. Using the power of the sun and with the help of rainwater, the glass is able to repel dirt and debris giving you a crystal-clear roof whatever the weather. 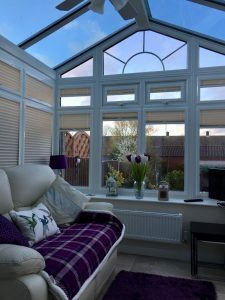 The family were extremely pleased with the difference their new conservatory has made to their home. We were also able to impress with our reliable and efficient service. No job is too big or small for us and with our sister company Astraseal we are able to access a wider range of products to suit any style and home.